Of all the world's major aquariums, this one in California is the most successful at being simultaneously very educational and interesting. 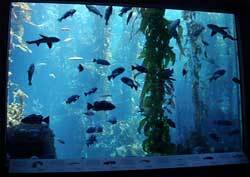 This glass-fronted three-story affair has a multitude of fish swimming around towering kelp (see photo). If possible, be there at feeding time when divers hand-feed the denizens. It boasts the world's largest Plexiglas viewing window, allowing you to see up close a slew of large-fish species in a single glance. Observe energetic, fun-loving sea otters as they dash about in and out of the water. It teems with natural inhabitants including crabs, anemones and sea stars. See a giant octopus and walk through a special wave-crash tunnel. Non-permanent presentations can also be stimulating.